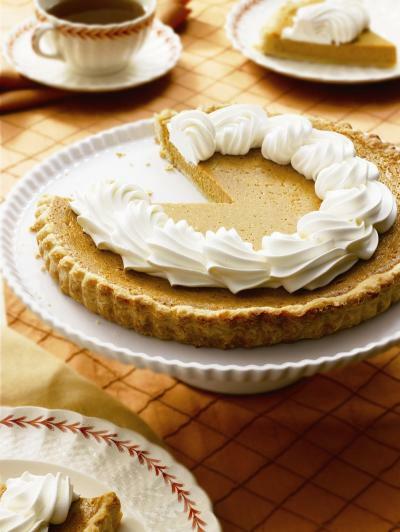 A traditional holiday favorite, this pumpkin pie recipe won’t weigh you down! With just 3 Points per serving, it’s the perfect Weight Watchers dessert recipe to try out this Christmas or next Thanksgiving! It tastes amazing, and has all the creamy, pumpkin-y goodness of the traditional pumpkin pie, but with a lot less fat and calories. It’s also pretty easy to make and will make a fantastic ending to your holiday meals. Try topping it off with a bit of Fat Free Reddi-Whip for an added touch! Without a doubt, you’ll be gobbling down some pumpkin pie this Christmas, so why not make a much healthier version of it to share with friends and family. The key to this classic holiday recipe being so low in Weight Watchers Points, is replacing a butter-laden crust with layers of light, crispy phyllo dough; using fat-free egg substitute instead of whole eggs; and using vanilla extract for sweetness. Not only is this a great dessert to serve after Christmas dinner, but make sure to keep this Weight Watchers Pumpkin Pie dish on file for next Thanksgiving too, as it’s the best Weight Watchers Thanksgiving recipe for pumpkin pie that you’ll ever find! Preheat oven to 350°F. Lightly coat a 9-inch round pie pan with cooking spray. Cut phyllo sheets in half. Place 1 sheet in prepared pan and lightly coat with cooking spray. Top with another sheet of phyllo, placing corners just to the right of the previous sheet’s corners. Repeat with remaining sheets to form a circle. Press layered phyllo into pan and roll in edges. Bake until lightly browned, about 10 minutes. Whisk together brown sugar, spices, cornstarch and salt in a large bowl. Whisk together pumpkin, evaporated milk, egg substitute and vanilla in a medium bowl. Gradually whisk wet ingredients into dry ingredients. Pour filling into crust. Bake until set, about 50 minutes. (Cover crust edges with foil during baking if they are becoming too brown.) Cool completely before cutting into 8 slices. For those that want the points plus for the new program- it’s 4 per serving, hope it helps! Thanks laloosh for the recipe! What is phyllo crust and where do you get it? It's a thin, flaky pasty crust that is used when making many pastry recipes. You can usually find it in the frozen desserts section at your grocery store.